You will be picked up at the hotel at 8:00am. Starting the day trip will be a visit of the Ho Chi Minh Complex, which compromises Ho Chi Minh’s mausoleum (closed on Mondays & Fridays), his former stilt-house residence, the Presidential Palace. We will then visit the Temple of Literature constructed in 1070 to worship Confucius, which served as the first Royal National University in Vietnam. The site also honors 82 Vietnamese doctorates who passed a number of rigid exams in the feudal ages. Their names, birthdays and birthplaces are engraved in 82 headstones perched on stonetortoises. It is widely believed that touching the heads of these tortoises will bring luck. Its peaceful green compound with its neatly maintained lawns, gardens and lotus ponds make it a tranquil hideaway from the city’s bustle and heat. Lunch will be served at a local restaurant. You continue your tour of Hanoi at Thanh Chuong Palace. From a distance of 200 meters you will be able to spot the palace’s tower, rising above the temples and pagodas of the complex. 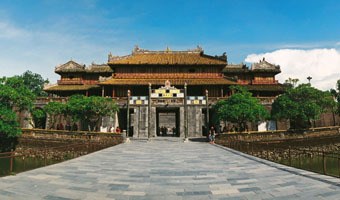 You will step through the large wooden gate to find youselve immersed in Vietnamese culture. Traditional buildings and artifacts from across the country are on display here. The buildings of Thanh Chuong Palace all have numerous doors opening to different directions, thereby allowing greater interaction between human beings and nature. The buildings are home to countless Buddha statues and ceramic, pottery and stone objects, which Thanh Chuong has been collecting for the last 30 years. 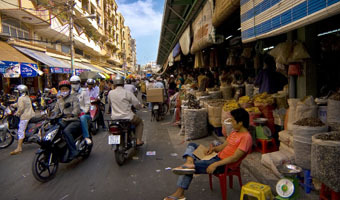 You will have lunch at a local restaurant and then drop you off at your Hanoi hotel. The rest of day is yours to explore the city on your own until you head to the train station to catch the night train to Lao Cai. Overnight on the train. You will arrive in Lao Cai around 6:00am andcontinue to Sapa, situated 40km from Lao Cai,by private car. After breakfast we will explore Sapa town, founded by the French as a holiday resort. 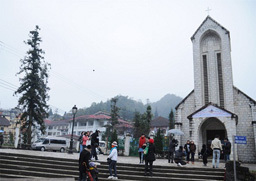 You then have time to leisurely stroll around Sapa, and visitSapa’s market and its old cathedral.You are bound to encounter people of various ethnic minority groups such as the Black H’mong, Day’z and Red Zao wearing their traditional colorful dresses. In the afternoon, you will visit Cat Cat village, home to H’Mong ethnic people. They are excellent “tho cam” weavers, a kind of brocade fabric. 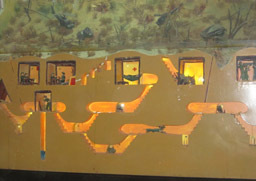 The “tho cam” of Cat Cat village is of especially high quality, as it is dyed with natural colors, polished with beeswax and embroidered with unique designs. Cat Cat silver jewelry such as necklaces, bracelets, rings and earrings are known fortheir sophisticated production techniques. A walk through this old village offers a glimpse into traditional customs and practices of the ethnic Black Hmong. You will stop at a beautiful waterfall and the remains of a hydroelectric plant built by the French during theircolonization of Vietnam. Overnight at hotel in Sapa. Enjoy breakfast at the hotel before commencing your full day tour of Sapa, starting with its vibrant market and colonial houses. Descending into the MuongHoa Valley, you will reach the picturesque Lao Chai village home to the Black H'mong ethnic minority and Ta Van village inhabited byDzay. Enjoy stunning views of rice terraces curving around the hillside, winding rivers and streamsglistening in the sunshine. Enjoy a picnic for lunch. On the way back to Sapa, youwill visit Ma Tra village, home to Black Hmong ethnic people. You then return to Lao Cai train station by car to catch the night train to Hanoi. Overnight on the train. You will arrive at Hanoi train station early in the morning at 5.30am. You will be picked up from the station and brought to a 2 star hotel to freshen up and have breakfast. 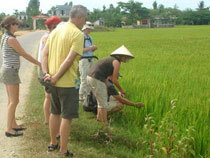 From there you start your three-hour drive through the Red River Delta to Halong, situated 180km southeast of Hanoi. There will be various photo stopsand coffee breaks en route before arriving at Halong’s pier. 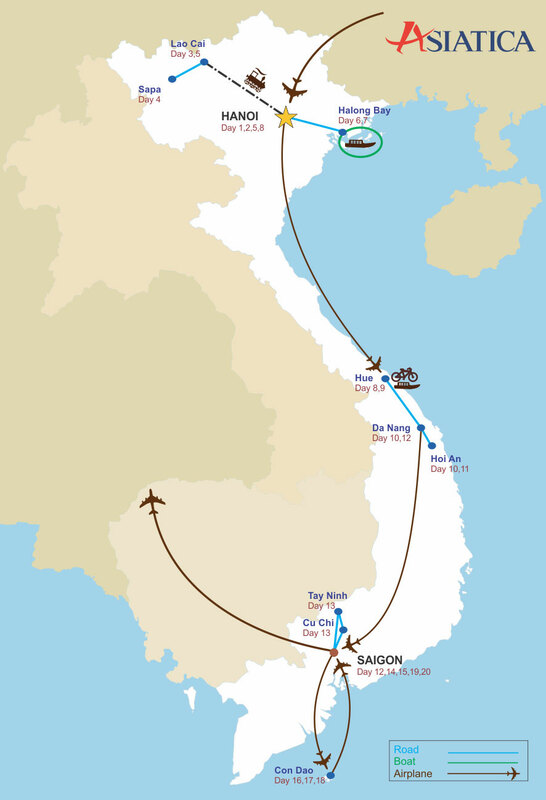 The cruise provides an introduction to the amazing scenery of Halong Bay and Bai Tu Long Bay. Cruising through Halong Bay will literally take your breath away. Start the day with Tai Chi - physical movements designed for relaxation, balance and health - on the sundeck of the boat while enjoying the panorama. After breakfast on board, visit Vung Vieng fishing village by rowing boat in 01 hour. Savour a delicious lunch in the Halong Restaurant while the ship cruises towards Lan Ha Bay and Cat Ba Island for walking excursion in the national park of Cat Ba Island and visit of The Au Co organic farm. Back to The Au Co to enjoy Happy Hour and Cooking Demonstration then a sumtupous seafood BBQ. The ship anchors at Drum Cave. Awake early and join the Tai Chi session to help you feel fresh for the guided tour of Sung Sot cave, the most beautiful cave with many photo opportunities. Note there are about 715 stepsto climb (optional). On the way backto port, enjoy breakfast and take a last glimpse of the beautiful scenery from the bar or sundeck. Back to Halong wharf and disembark .Free time for shopping . 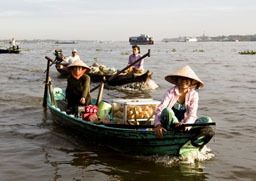 Ypur driver and guide will pick you up at your hotel in Hue at 8:00am for a boat trip on the poetic Perfume River. Watchriver life and enjoy the peaceful scenery along the riverbanks. 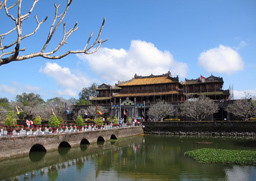 Stop en route to visit the iconic Thien Mu Pagoda also known as “Heavenly Lady Pagoda”, the symbol of Hue, and Minh Mang Mausoleum, one of Hue's finest royal tombs. An architectural complex compromised of 40 buildings (palaces, temples, pavilions, etc.). Enjoy unique Hue dishes for lunch at a local restaurant. 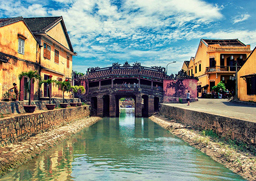 In the afternoon stroll through Hoi An’s ancient town to discover its sights: Chua Cau or Japanese Pagoda Bridge, considered the symbol of Hoi An and a fine example of Japanese architecture. 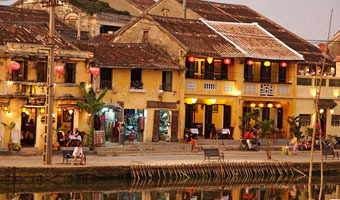 Step back in time when walking down Chinese Street with its stunning PhucKien Hall and old Phung Hung houses typical of HoiAn’s original architecture. Overnight at hotel in Hoi An. After breakfast you will be taken to Danang airport for your flight to Ho Chi Minh City where you will check into your hotel. In the afternoon you will be picked up to visit the Notre Dame Cathedral and the General Post Office. 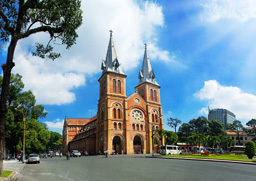 The Saigon city tour then continues along Dong Khoi Street, where the Opera House and the Peoples’ Committee building, built in 1897 by French architect Ferret Eugene, are situated. The 800 seat Opera House served as the home of the Lower House Assembly of South Vietnam after 1956. You will then visit The Reunification Palace, formerly known as Presidential Palace, which was the residence of the president of South Vietnam until the end of April 1975. Overnight at the hotel in Ho Chi Minh City. You will be picked up at the hotel at 8:00am to drive to Tay Ninh, 100km from Saigon, to visit the ornate temple of Cao Dai and attend a fantastic mid-day service.Caodaism followers fill the hall wearing colored robes, a symbol of this curious combination of Confucianism, Taoism and Buddhism. Lunch at a local restaurant. 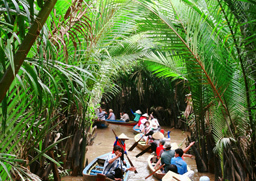 Morning transfer to Ham Luong River in Ben Tre, where you will board the Mango Cruise. Upon boarding, your luggage will be brought to your cabin and a refreshing welcome cocktail will be served on the deck where you will meet the crewmembers. A delicious lunch will be served onboard. Your first stop will be Mo Cay floating market where the locals buy fresh fish, meat, vegetables, as well as more exotic delicacies like rat and snake. You continue cruising along the canals and stop at a village for a short walk and to visit a coconut processing factory, where coconut oils and coconut fibers are made. Return to the boat for a cold drink and time to relax on deck. Lunch will be served on board. You then head down Vung Liem Canal to cycle to a traditional brickwork shop and the lively town of VungLiem, with its fascinating Cao Dai and Kh’mer temples. The boat will then cruise to Tra On where you stop for the night. You will have time to freshen up before heading to the deck for a cooking demonstration before enjoying a delicious 5-course dinner. The rest of the evening is free. Rise early in the morning to visit Tra On floating market before heading to Can Tho. You will the stop at the spectacular Cai Rang floating market, where you will transfer to a smaller boat and mingle amongst the thousands of trading vessels. Feel free to buy fruit or drinks from the local vendors. After your market visit, your will return to the Mango Cruise and soak in your surroundings, before being dropped off at NinhKieu quay in Can Tho. Return to Ho Chi Minh City for the night. Breakfast at the hotel where you room will be available until noon.You will then be taken to the airport for your flight back to Ho Chi Minh City. Overnight at hotel in Ho Chi Minh City. Free time for last minute shopping in Ho Chi Minh City, before being taken to Tan Son Nhat airport for your return flight. The hotel room is available until noon only. Asiatica Travel’s services end here. Hotels 4-5 stars (based on 2 persons/room) as mentioned in the program. 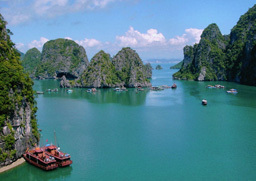 Boat trips as mentioned in the program, including comfortable junk in Halong Bay with private cabin. 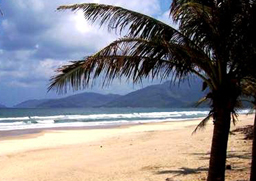 Tay Ninh and Cu Chi are major destinations near Ho Chi Minh City. 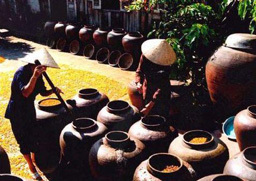 Both are made famous worldwide by the Vietnam-American war and each has its own appeal. Tay Ninh is the cradle of Cao Dai religion in Vietnam, home to the tasty Trang Bang Noodle Soup and the legendary Ba Den Mountain. 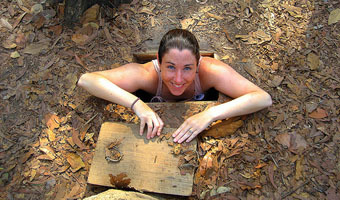 Cu Chi is best known for its amazing underground world, an intricate system of tunnels once serving as concrete bases of Vietnamese guerillas during the war.